Previous editions: 2014, 2013, 2012, 2011. The author, a surgeon, explores how end-of-life care in the U.S. developed and why its outcomes are so often poor, as his own father nears death. He suggests that thoughtful treatment choices be guided by the patient’s reflection on a series of questions. Research suggests that about half of our traits are inherited–children are shaped 50% by nature, 50% by nurture. It is widely assumed that nurture means “parenting.” In this compelling book, Harris argues that long-term parental influence (beyond genetics) is negligible. Instead, the child’s peer group dominates. Empathetic and keenly observed vignettes of parenthood in America today. Briefly, a history of the Gemini telecopes, but really a much broader story of the evolution of optical astronomy in the U.S. Shows how institutional tensions and Congressional fiat gave the U.S. a minority share in two telescopes rather than a true national facility. A harrowing but important book following a group of Iraq veterans as they reenter their lives back home. Beautiful, achingly sad historical fiction about the life of the Russian Lev Sergeyevich Termin—inventor, lover, spy, and political prisoner. Innovative cocktail recipes and techniques from the cutting-edge New York bar. A detailed history of the Old Fashioned cocktail—sugar, bitters, spirit, twist. Previous editions: 2013, 2012, 2011. A perceptive and moving account of the recent history of the United States, told through the experiences of Americans both famous and ordinary. A closely observed, richly human story that happens to be about football. The author spent the 2011 season embedded with the New York Jets, and he draws perceptive and compelling portraits of the coaches and players as they struggle with forces outside and inside themselves, on the field and off of it. Only a professional comedian could find amusement in trying to raise five young children in a two-bedroom walk-up apartment in Manhattan. Several intertwined narratives follow characters in modern New Jersey as they attempt to manage the detritus—physical, emotional, moral—filling their lives in a time of cheap abundance. An exhaustive and evenhanded history of the many intertwined causes of the financial crisis. Surveys the unintended consequences of dual incomes on families with children—particularly increased bankruptcies as families overextend themselves bidding up homes in good school districts and cannot recover from unexpected events. Summarizes unheralded but compelling recent research related to children: why some kinds of praise can backfire, the problems with giftedness tests for kindergarteners, the roots of lying and bullying, why teenagers arguing is a good thing, and more. A hilarious travelogue through Australia, rendering clearly the beauty and uniqueness of the country. Sometimes what new parents need most is a laugh. The IPython Notebook combines code, documentation, and computational results in one package that’s easy to share. It’s proving a great way to teach, as notebooks are easy for the instructor to write and for students to modify. Notebooks also provide seamless integration with other programming environments through extensions providing “magic functions“: short code prefixes beginning with % or %% that call other interpreters, like R or Octave. Since many astronomers who might want to transition to Python already know IDL, I wanted to provide an %idl magic function for IPython so they could easily call existing code. The difficult interfacing between IDL and Python was already done by Anthony Smith‘s pIDLy package. (As a bonus, it supports the free GDL interpreter as well.) I adapted the Octave magic code to provide %idl magic functions with consistent syntax. You can find the code on github as ipython-idlmagic. The demonstration notebook below is available on github as well, or you can view it with nbviewer. The mechanisms for passing variables to and from IDL are based on those in the built-in %R and %octave magics. Inline plots are displayed automatically by the IPython notebook. IDL Direct graphics are used. The optional -s width,height argument (or --size; default: 600,375) specifies the size of the resulting png image. The %idl line magic fails with TypeError: coercing to Unicode: need string or buffer, dict found in current release versions of IPython (0.13.2 and below) due to a known bug; the github development version of IPython works as expected. The plotting capabilities are rather kludgy due to IDL’s old-school graphics routines. I opted to implement Direct Graphics, which are the lowest common denominator supported by IDL and GDL. Since I have to initialize the device before the plot call and close it afterwards, the %idl magic can only produce one plot output per notebook cell. The plotting code produces overhead on non-plotting lines as well, unfortunately; I chose syntactic simplicity over execution speed for the time being. Stay tuned to see it in action! At this week’s meeting of the High Energy Astrophysics Division of the American Astronomical Society, I learned that one of the teams analyzing data from a NASA observatory had run into trouble with their machine learning classifier. Their problem illustrates one of the particular challenges of machine learning in astronomy: sample selection bias. 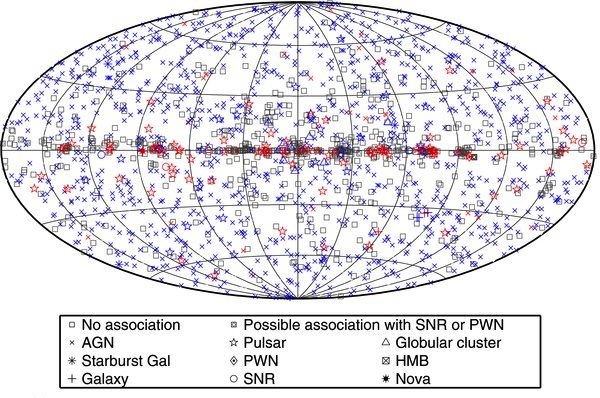 All-sky map of Fermi sources (Nolan et al. 2012). At first glance, it looks like a classic machine learning problem. The Fermi Gamma-Ray Space Telescope has performed a highly sensitive all-sky survey in high-energy gamma-rays and detected nearly two thousand sources, most of which are unidentified. It’s expected that most of these will either be pulsars–rapidly-rotating neutron stars–or active galactic nuclei (AGN), accreting supermassive black holes in distant galaxies. Many teams (including one I work with) are interested in detecting the Fermi pulsars in radio or optical bands. We’re interested because many of these pulsars proving to be rare “black widow” systems, where the pulsar in the process of destroying its low-mass companion and it is possible to determine the mass of the neutron star. However, telescope time is precious, so there needed to be a way to prioritize which systems to follow up first. 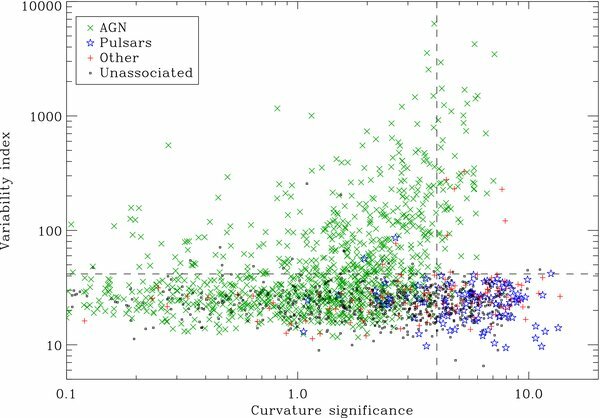 The pulsars and AGN are distinguished by their variability in the gamma-ray band and by the presence or absence of curvature in their spectra. It seems obvious, then, to train a classifier on the data for the known systems and then use it to predict the class of the unknown systems, and several groups did just that. Spectral curvature vs variability for Fermi sources by source class (Nolan et al. 2012). However, when the Pulsar Search Consortium searched the newly-prioritized list, they found fewer new pulsars, not more. The problem turned out to be a bias in the training set: the known sources used for training are brighter than the unknown ones being predicted. In this case, the major effect was that the fit of the spectral curvature was inconclusive for dim sources–there weren’t enough counts to tell a curved line from a straight one, so the features fed into the classifier weren’t reliable. As usual, garbage in, garbage out. In astronomy, this situation is quite frequent: the “labelled data” you’d like to use to train a classifier on is often systematically different from that which you’re trying to classify. It may be brighter, nearer, or observed with a different instrument, but in any case blindly extrapolating to new regimes is unlikely to yield reliable results. Joey Richards and his collaborators describe this problem of sample selection bias in great detail in their excellent paper, where they focus on the challenge of classifying different types of variable stars from their light curves. They find that iterative Active Learning approaches are most effective at developing reliable classifiers when the unlabelled and labelled data may be drawn from different populations. In Active Learning, the classifier identifies the unlabelled instances whose classification would most improve the performance of the classifier as a whole. These targets can then be followed up in detail, classified, and the process repeated. This approach worked well for variable star problem, where the features used in the classifier were valid for all the sources. For the Fermi problem, the challenge is that one of the most informative parameters is unreliable for a subset of the sources. In this case it might be more useful to develop additional features that might identify spectral characteristics even in the low-flux regime. Choose your text size. As a first step, be sure your text is set to the minimum allowed point size. Get the margins right. The geometry package provides the easiest means to specify margins. Compress your lists. Standard LaTeX list environments leave lots of whitespace between the items. The paralist package provides compactitem and compactenum, drop-in replacements for itemize and enumerate. Use runin headers. If your document is of any length, it’s helpful to organize it into parts, sections, subsections, and possibly even subsubsections. Standard LaTeX classes give each of these large headings on their own lines. The titlesec package provides an alternative: run-in headers. These appear in-line in the text, saving space. You can adjust the format and numbering with the \titleformat command. The commands below set up small-caps part headers on their own lines (“hang”), and variously sized run-in bold headings for sections. Use superscript citations. If your field allows it, no citation notation uses less space than superscripted numbers. The natbib package makes it easy. Single-space the bibliography. The code below removes the bibliography section label and single-spaces the entries: put it in the document header. Use or make a compact bibliography style. Exclude anything you can from the reference list. I made a BibTeX style file which defaults to “et al.” anytime there is more than one author. Discourage floats from getting their own pages. LaTeX uses a number of numeric weights to calculate where to position floats. Fiddling these parameters in the document header will encourage LaTeX to place them closer to each other and the text. Vacuum up the extra whitespace. Several more header parameters adjust white space between document elements. (Adjust or remove indentation.) Changing the paragraph indentation level can recover a few characters, but it makes the text harder to scan. (Black Hat: Shrink the inter-line spacing.) While I’m not comfortable with this measure and it makes the text hard to read, it is possible to make the line spacing less than one. As usual with LaTeX, there are multiple ways to accomplish the same goals–these are methods I personally have found convenient. The savetrees package provides an all-in-one solution which may be sufficient if you don’t want to tune the document style yourself. Jake Klamka spoke at Caltech a few months back about his Insight Data Science Fellowship–a program designed to help science PhDs transition into jobs in data science. The program guides scientists in packaging skills they already have so that employers can easily see the relevance and value to their business. Jake’s own initial difficulty getting a tech job inspired the program–after working as a particle physicist, he didn’t have any resources to help him determine which skills were important to learn and to help him get unstuck when he had problems. Python. In many ways the lingua franca of programming today, Python is an excellent all-in-one tool for everything from scripting to web programming to statistical analysis. R is a useful second language. Databases. SQL is a must. The Hadoop ecosystem is important, but it’s probably more practical to learn on the job. Computer Science fundamentals–Most scientists have no formal CS training, but knowledge of basic algorithms and data structures is vital for working with large datasets. Machine Learning–A high-level understanding of what’s possible will let you get started. To these, I might add familiarity with the basic tools of software development (“software carpentry“), particularly version control and unit testing. Scientists presumably have ample experience with statistics and quantitative methods. Data science in practice encompasses a huge and growing range of tools and techniques, but this core curriculum provides a manageable start. We live in a fortunate time–there are many excellent free online courses so you can learn these skills now, on your own time–and they’ll even be valuable in your current academic job!